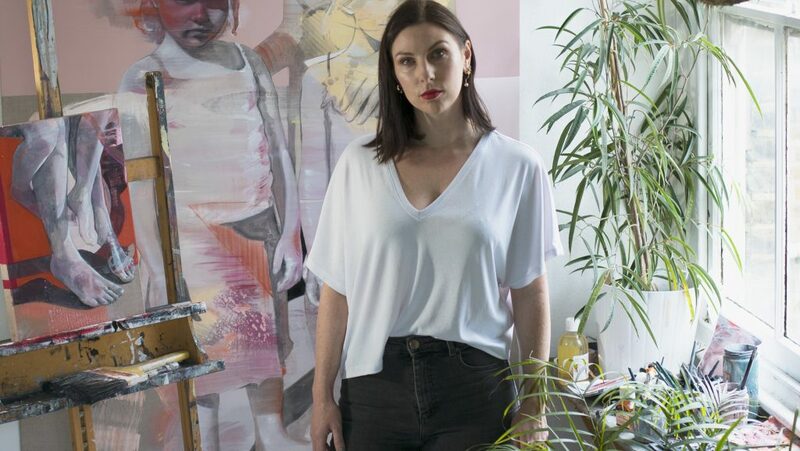 It has been a very busy year for Rebecca Fontaine-Wolf, who just won the Special Fine Art Award: the main prize at the SWA exhibition at the Mall Galleries (the prize-winning piece ‘ the eye of the storm’ is now available via New Blood Art). She is about to have her 3rd solo show of 2018, as well as moving into a curatorial role both with the society of women artists where she has been on the selection panel / curating the society’s annual exhibition at the Mall galleries for the past 2 years, and being invited as a guest curator for Gallery Different’s ‘Muse, Model or Mistress’ show last month. An all female show staged in collaboration with flying elephant productions’ critically acclaimed performances of Picasso’s Women held in the gallery. The exhibition’s timely theme investigated the role of women in the art world, and opened up a discussion of how the muse’s position changes through the female rather than the male gaze. She has also recently been included in Photographer Carla Van de Puttelaar’s ‘Artfully dressed – women in the Artworld’ project – a portrait series of influential women in the art world where she is featured alongside Maria Balshaw CBE, Director of the Tate Art Museums and Galleries and Zoe Whitley curator at the Tate, to name but a few.